Why Won't You Grow?! : Why Didn't They Just Name it HAL and Begin the Enslavement? Why Didn't They Just Name it HAL and Begin the Enslavement? "We left one thing out," says Mr. Schiller. "It's about our voice." This is the fruit of Apple's acquisition of Siri, a startup that has been working on voice-control features. 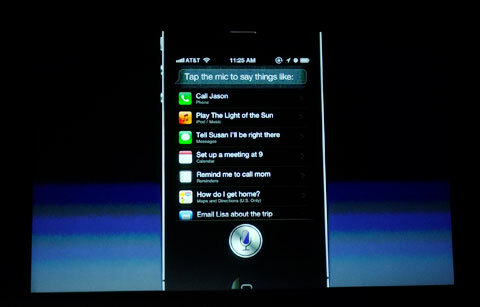 Siri is now a feature on the iPhone. "It's an intelligent assistant that helps you get things done, just by asking." "Probably the craziest thing you can do is do a voice-recognition demo on stage, live," says Mr. Schiller. "But we're going to do it anyway." Scott Forstall, Apple's iOS chief, is back on stage. He asks the phone, "What is the weather today?" The phone replies, "Here is the weather for today," and displays the weather screen. Mr. Forstall asks, "Do I need a raincoat today?" The phone replies, "It sure looks like rain today," and shows the weather screen again. "What time is it in Paris?" he asks. The phone replies with the time in Paris and shows a clock. "Wake me up at 6 a.m.," says Mr. Forstall. "O.K., I've set an alarm for 6 a.m. tomorrow," the phone replies. This is amazing. And freaky. Apple's set up a partnership with Yelp as well. "Find me a great Greek restaurant in Palo Alto." The phone says: "I've located 14 Greek restaurants. Five are in Palo Alto. I've sorted them by rating." Mr. Forstall: "Do I have any meetings this Friday at noon?" Phone: "You don't have any meetings on Friday at noon." You can ask Siri for directions. It can read text messages to you. You can reply or ask it to read them again. Siri can schedule events in your calendar, read messages, take dictation, all by voice. You can create a reminder by voice. "Remind me to call my wife when I leave work," says Mr. Forstall. Siri, based on previous conversations, knows who your wife is and uses geolocation to remind you when you leave a location. You can search Wikipedia by voice. Apple has also linked up with Wolfram Alpha to provide data and definitions for Siri to access. "Define mitosis," says Mr. Forstall. Siri generates and reads back a definition. We are clearly headed to Terminator/HAL territory here. Humans are doomed. Deal with it. Mr Forstall asks Siri, "Who are you?" Siri replies, "I am a humble personal assistant."